PRLog - Oct. 2, 2014 - BERKELEY, Calif. -- On Friday, October 10th the California Jazz Conservatory hosts a concert of jazz music with vocalist and author Ellen Johnson to celebrate the release of her highly anticipated biography, Jazz Child: A Portrait of Sheila Jordan, published by Rowman and Littlefield. Johnson will be singing selections dedicated to her musical mentors and from her upcoming recording, Form & formless. As George Harris wrote in All About Jazz, "while other singers are rehashing the great American songbook, Johnson is putting it through the meat grinder and creating a whole new menu." Besides Johnson on vocals, the quartet features Jason Martineau (piano), Peter Barshay (bass), and Bryan Bowman (drums). The festivities begin at 8 pm with two sets and general admission $15 or $12 for students and seniors. Tickets can be purchased at:http://cjc.edu/event/ellen-johnson/or call 510-845-5373. The California Jazz Conservatory is located at 2087 Addison St., Berkeley, CA 94704. Go to, http://www.ellenjohnson.net for more information about Ellen Johnson. BERKELEY, Calif., Aug. 26, 2014 /PRNewswire/ -- When Sheila Jordan dropped a nickel in the jukebox of a Detroit diner in the 1940s and heard "Now's The Time" by Charlie Parker, she was instantly hooked—and so began a seventy-year jazz journey. With Jordan's full cooperation, author Ellen Johnson documents the fascinating career of the 85-year-old NEA Jazz Master who stands today as one of the world's most deeply respected jazz vocalists and educators. Jazz Child: A Portrait of Sheila Jordan published by Rowman and Littlefield releases on September 16th and is the first complete biography about this remarkable singer's life with a personal and touching foreword by Don Heckman, former Los Angeles Times Jazz Critic and current editor for The International Review of Music. According to Howard Mandel, author and president of the Jazz Journalists Association, "Ellen Johnson's portrait of Sheila Jordancaptures the warmth, modesty, determination and sublime creativity of a unique woman who's become a jazz master and American cultural hero. We read about a golden age of jazz in Detroit and New York City; interracial friendships and romances; abuse, addiction and recovery, motherhood and triumph -- all in the service of illuminating a life of beautiful music." Johnson reveals within the book the challenges Jordan confronted, from her growing up poor in a Pennsylvania coal mining town to her rise as a bebop singer in Detroit and New York City during the 1950s to her work as a recording artist and performer under the influence of such jazz giants as Charlie Parker, George Russell, Lennie Tristano, Charles Mingus, Sonny Rollins, and Thelonious Monk. As The New York Times announced, "Her ballad performances are simply beyond the emotional and expressive capabilities of most other vocalists." Johnson spent more than six years interviewing friends, family and jazz luminaries. "It was important to Sheila that her story be told from the perspective of a woman," said Johnson, "and also as a jazz vocalist and educator I could convey a point of view that was essential to her story. This book is an inspiration to anyone who is confronting struggles or dealing with insurmountable challenges, and proof that dreams can be achieved at all walks of life." Johnson has over thirty years combined experience as a professional musician, educator, writer, publicist, songwriter and lyricist. For jazz fans, Jordan's biography is a testament to a vanishing generation of musicians and the importance of her indomitable spirit in keeping the music alive. As the prominent jazz saxophonist Sonny Rollins commented, "It's about time that somebody wrote a book about Sheila Jordan. People need to hear something real that's going to make a difference in their life. This is a message that the world needs." 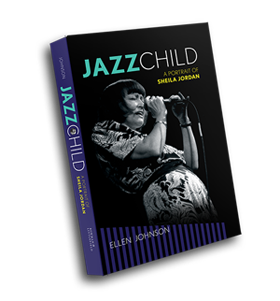 Jazz Child: A Portrait of Sheila Jordan is available through Amazon (http://www.amazon.com/Jazz-Child-Portrait-Sheila-Studies/dp/081088836X) or from Rowman and Littlefield Publishing Group (https://rowman.com/ISBN/9780810888364). For more information, go to www.jazzchildthebook.com or contact jazzchildthebook (at) gmail.com. For the book Johnson spent more than six years interviewing friends, family and jazz luminaries such as Sonny Rollins, Kenny Burrell, Frank Foster, Steve Kuhn, George Gruntz, and Kurt Elling. Don Heckman, former Los Angeles Times Jazz Critic and current editor for The International Review of Music, contributed a personal and touching foreword. Johnson admits, “I never thought I would be the person to write this book. However, I passionately believed that this amazing woman who has devoted her entire life to jazz music and confronting injustice deserved to have her events chronicled along with all of her friends and colleagues that contributed to the most significant era of jazz history.” Johnson herself has well over thirty years combined experience as a professional musician, educator, writer, publicist, songwriter and lyricist. She has served on the faculties and as a clinician at many prestigious universities and currently teaches at the Jazzschool at the California Jazz Conservatory (CJC) in Berkeley.